Okay, you asked for photos and I have LOTS of photos. So let’s get started! Las Vegas is only an hour flight away from Phoenix so I flew out on Saturday morning. There were a lot of people on the flight who were also headed to the race. When I arrived, my room at MGM Grand wasn’t ready yet so I left my suitcase with the bell desk and set out to grab some lunch at Paris. I wanted to keep my legs rested and avoid too much walking before the race so I took as much public transportation as possible on Saturday. 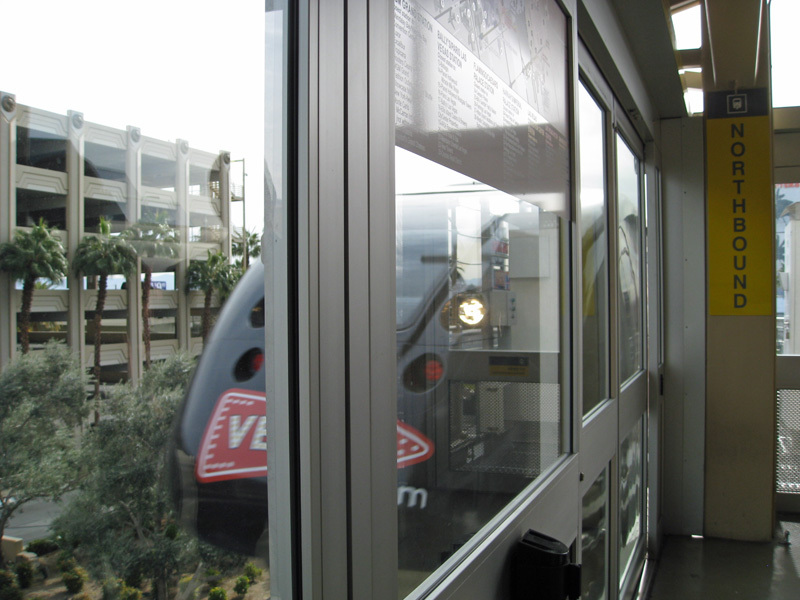 First up was the monorail which was $5 a ticket. I was only going one stop from MGM Grand to Bally’s (about 1 mile) so it was just a short 2-3 minute ride. 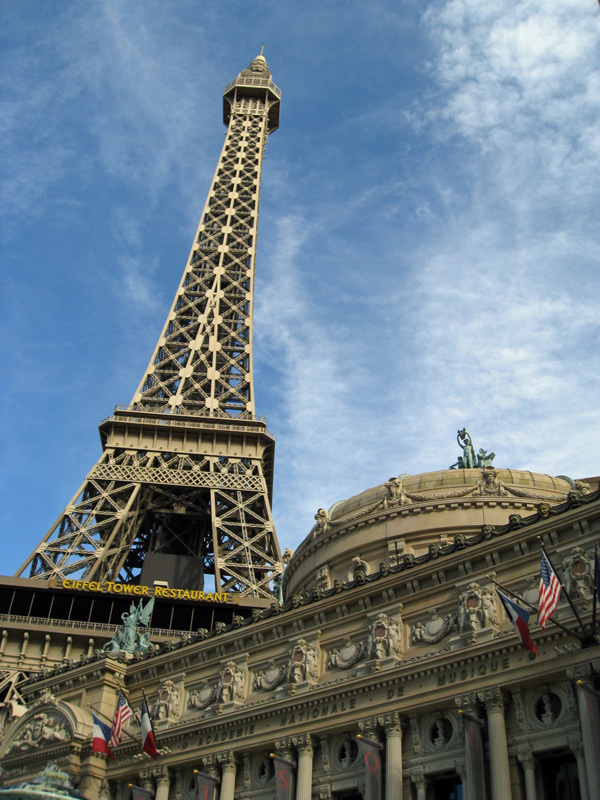 From Bally’s I was able to walk through to Paris without stepping outside. 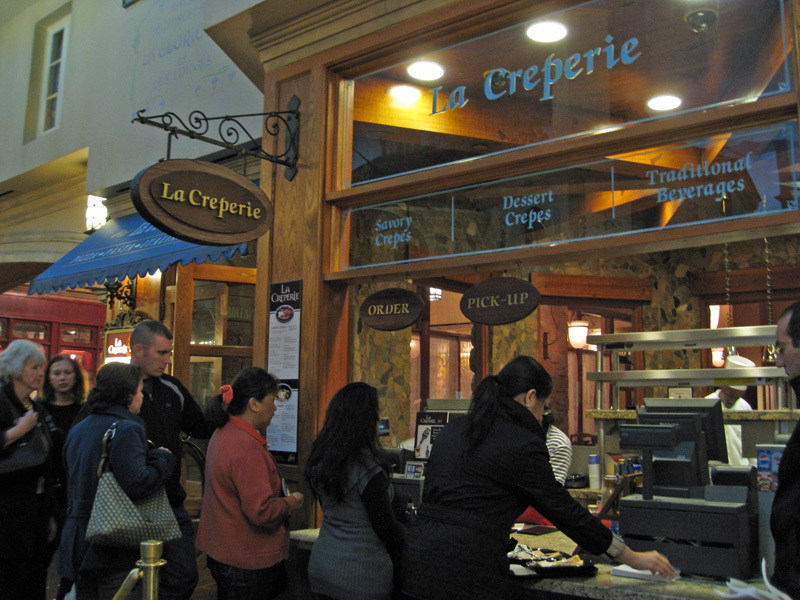 I already knew I was going to have a crepe for lunch, but it took me a bit to decide whether to go for a savory or sweet crepe… or maybe both? In the end I went with the Bayonne crepe which had prosciutto, mozzarella, basil, and a bechamel sauce. 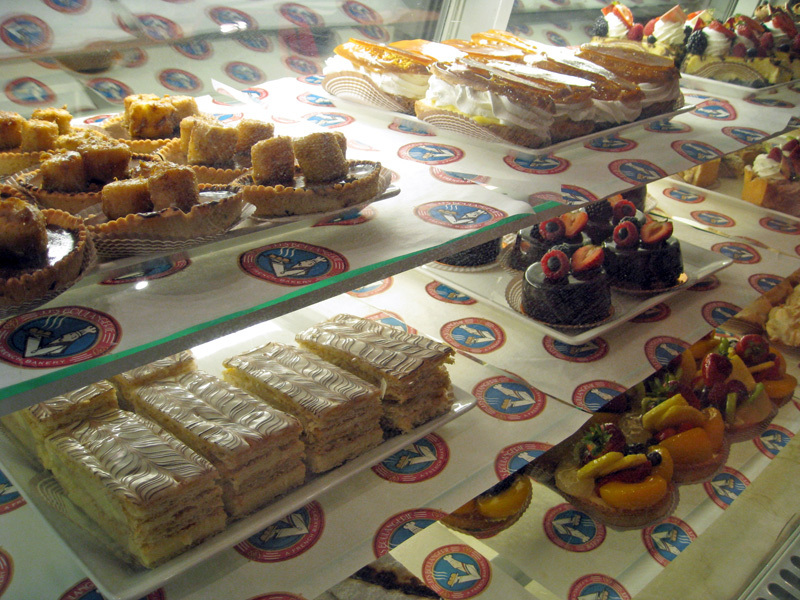 Then I went next door to JJ’s Boulangerie for dessert. I bought a Napoleon (in the bottom left of the photo) and a vanilla custard and spent the rest of the day snacking on them. Yummy! After lunch it was time to leave Paris and head to the Expo. On the way I came across a couple interesting characters. 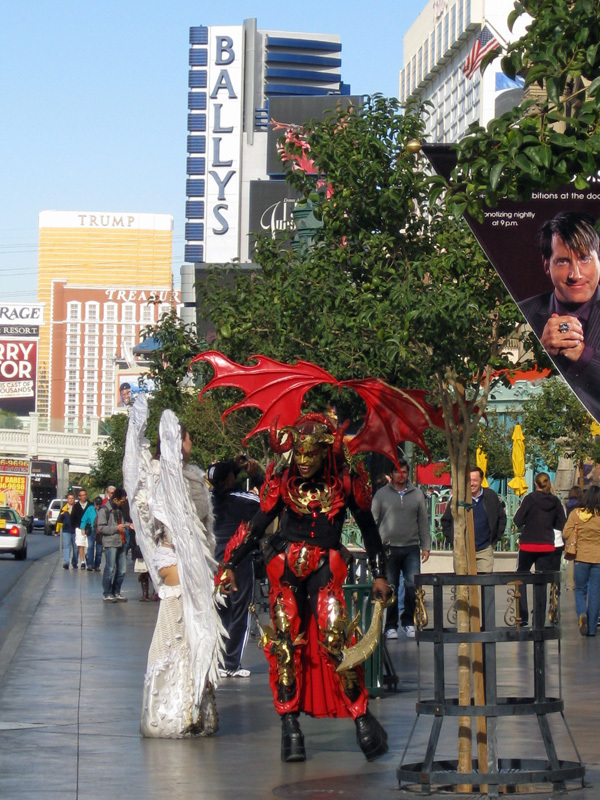 The guy in the devil costume was actually quite nice. As I walked past he said something to me like “good things do come in small packages” which brightened my day. At the time I didn’t want to stop and chat, but now I wish I had asked why they were out there. 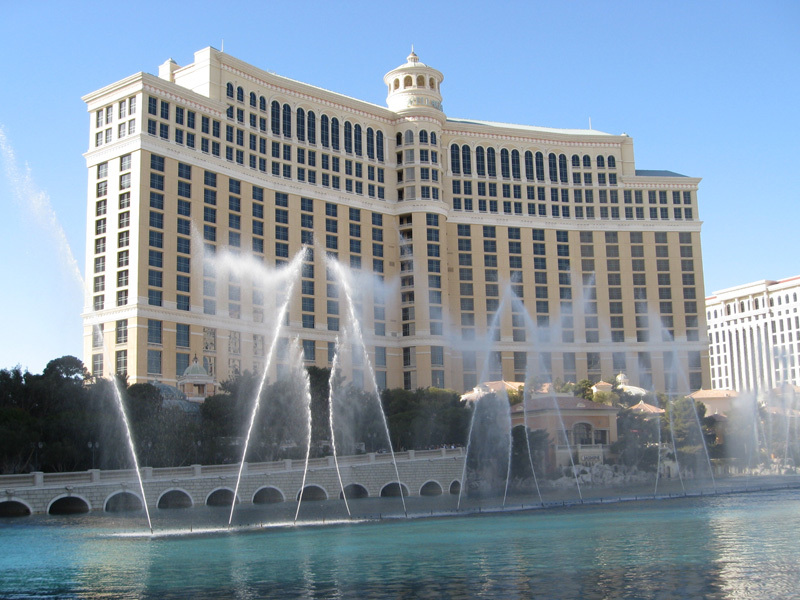 I had to cross the street to catch the bus and ended up in front of the Bellagio. I couldn’t resist going inside to see the Dale Chihuly glass in the lobby. 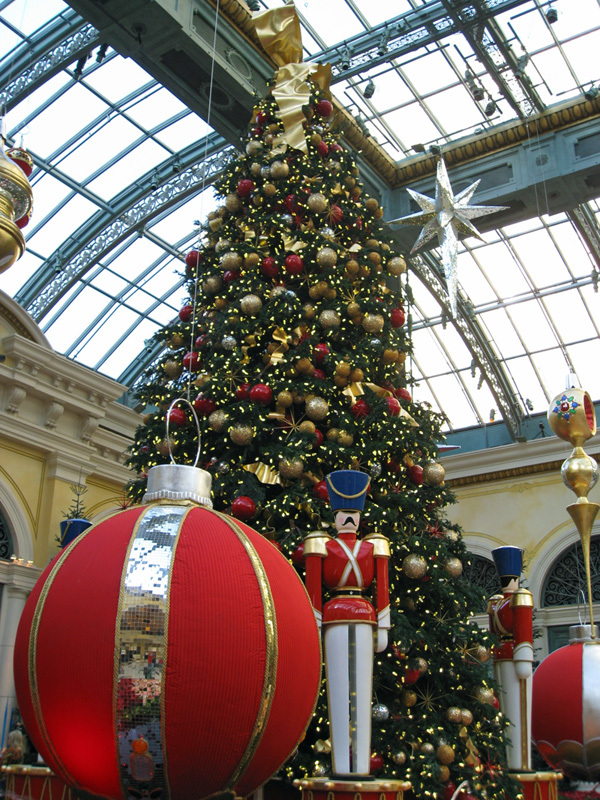 Then I wandered around the Christmas display in the conservatory. On the way out I was lucky enough to catch the water show. There’s a bus known as “The Deuce” that runs 24/7 up and down The Strip and stops at pretty much every hotel and casino. For $3, I took the bus from the Bellagio down to the Expo at Mandalay Bay (about 2 miles away). 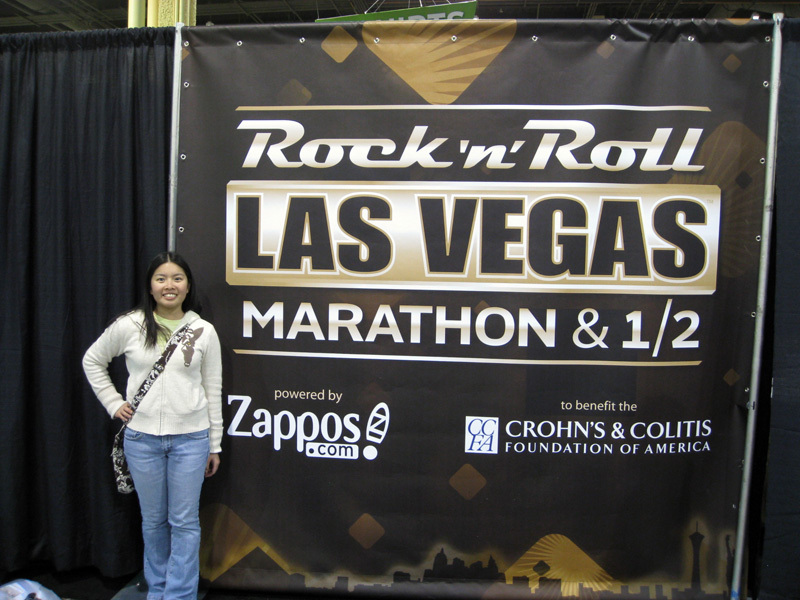 Once I got to Mandalay Bay I definitely started to feel the excitement of the race. 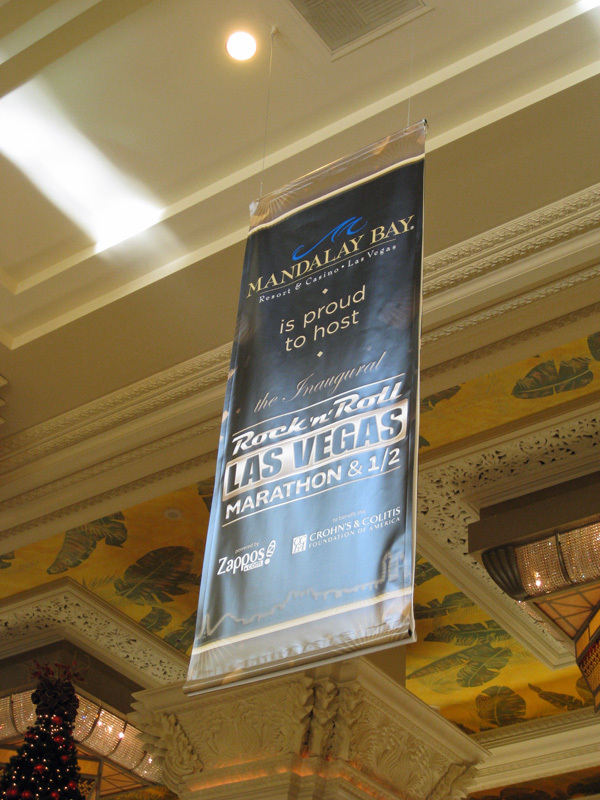 I loved that they had banners like this everywhere. It was actually quite a hike from the main entrance of Mandalay Bay out to the Convention Center, but eventually I made it. After picking up my race number, goody bag, and t-shirt, I headed into the merchandise area and found a nice person to take my photo. Then it was time to do some shopping. 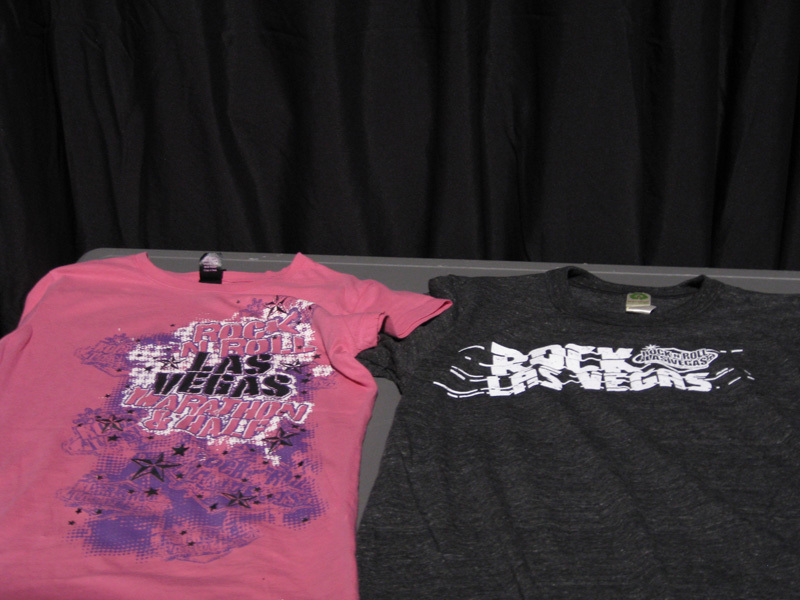 I narrowed it down to these two t-shirts. It was a tough decision, but I went with the pink. I also bought my usual souvenir pin to add to my collection. Despite the Expo being crowded, I enjoyed it. There were some great vendor boothes. The Wynn/Encore Hotels were handing out red beanies. 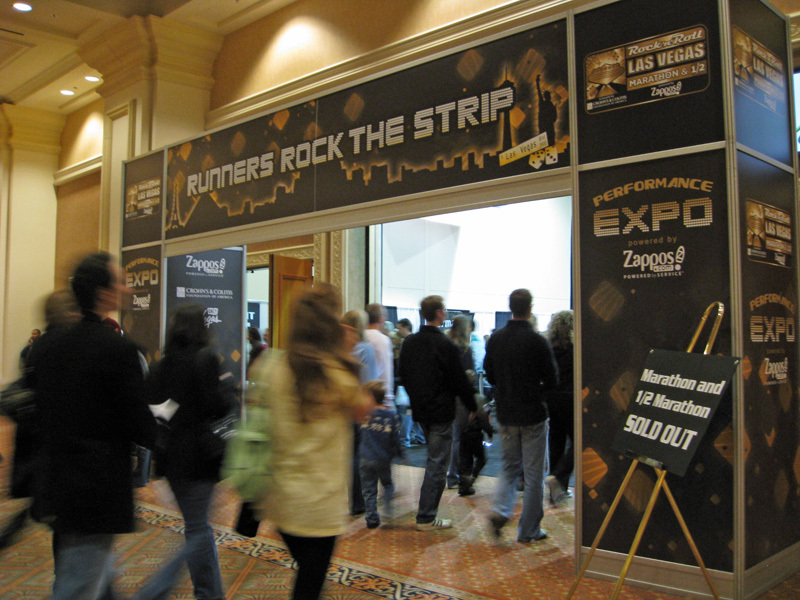 At the Zappos booth they were taking photos in front of a green screen, adding in a Las Vegas themed background, and giving out free prints. And I also picked up two Mickey-head shaped coasters advertising the new Disney Wine & Dine Half Marathon. I had a weird moment at the Larabar booth. For some reason there always seems to be a line for Larabar at Expos, and this one was no different. As I was getting my Larabar samples, this woman tried to cut in front of me. I commented that there was a line of people waiting their turn. She said “awww, it’s okay, you don’t have to be like that” and kept trying to reach around me for a sample. I got annoyed and sort of tried to block her so then she said “if it means that much, here have another one” and tossed the sample she had grabbed into my goody bag. Then she said “have a nice day” as she walked away. Huh? Was it wrong of me to point out that there was a line? I was glad I was pretty much done with the Expo at that point because the whole encounter left me feeling strange. Before I left Mandalay Bay I had one last stop. 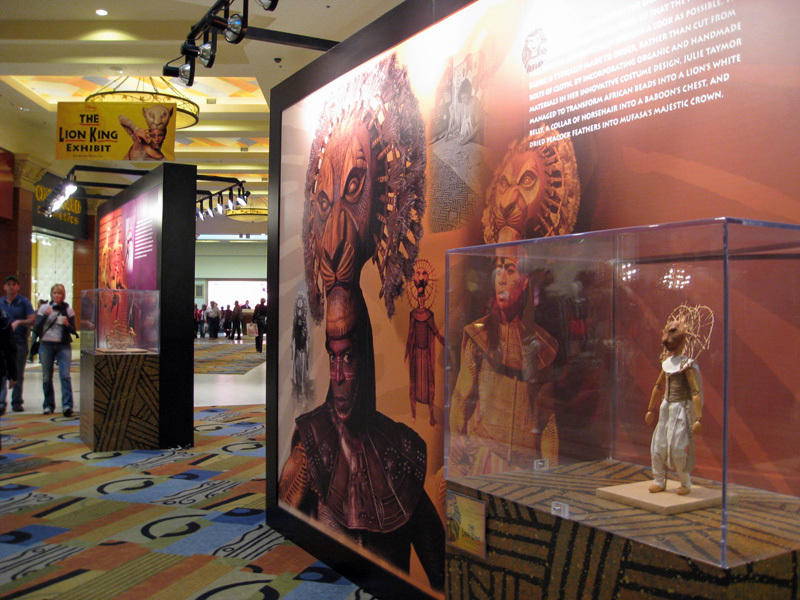 Mandalay Bay is home to The Lion King show. Being the Disney fan that I am, I had to check out the “behind the scenes” exhibit that was on display. I was hoping for something more like full-size costumes on display, but it was still pretty interesting to see the prototype models and read about the making of the show. Love all of the pictures! I would have pointed out the line to the lady too, that’s just rude and lines exist for a reason. The lady at the line…very odd. Maybe she was part of some social experiment? I like the Devil and Angel costumes. Great pics!